A beam of electrons has been sent through CBETA’s main section for the first time, to the end of the first girder with it’s permanent magnet array (PMA). The beam, measured at the design energy of 42MeV of the first ERL turn originated from a laser pulse hitting a cathode in the DC gun, was then accelerated in the SRF injector cryomodule (ICM) and traversed the Main Linac Cryomodule (MLC) before going through the first spreader line S1 and the first girder with the PMA. 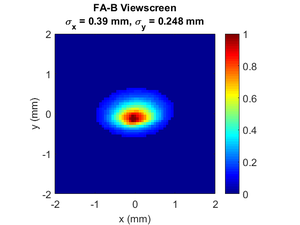 A well focused beam spot at the end of the first girder of the Permanent Magnet Array (PMA), measured at the design energy of 42MeV. A full twelve days ahead of schedule, this achievement highlights a very successful start to the first commissioning phase of this 4-turn ERL. While the DC gun and the two SRF linacs (ICM and MLC) were already constructed before CBETA started, S1 and the PMA comprise the first accelerator section that has been constructed specifically for the CBETA project. Transmission through this section is a very relevant achievement, because the rest of CBETA, to be installed during the next 10 months, will largely consist of a repetition of this PMA section and of 7 copies of the S1 line. 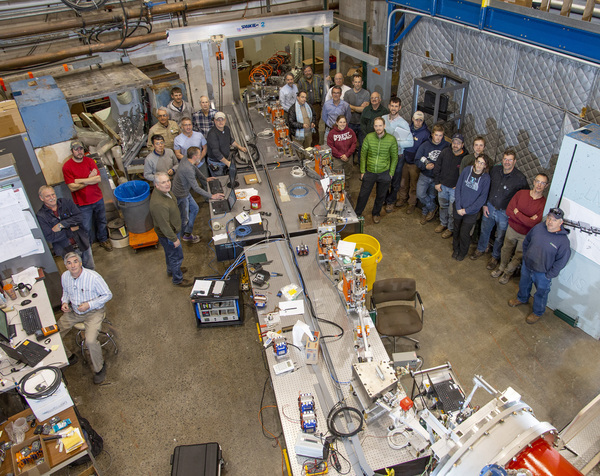 This beam transport is the final milestone before assembly of the full accelerator can start; it takes much pressure off an amazingly motivated commissioning team from Cornell and Brookhaven National Lab, augmented by international visitors. Commissioning of these components has excited significant interest in the worldwide ERL community, which lead to the attraction of 8 visitors from JLAB, Darsbury/UK and HZB/Germany. The commissioning period, which will last about another 4 weeks, will now concentrate on detailed characterization of beam and component properties, and on functionality tests of the control system.